This past week the EPA held public hearings in Pittsburgh, Denver, Atlanta, and Washington, D.C. on the proposed regulations to reduce carbon pollution by 30% from new and existing power plants by 2030. You can read about the EPA's proposed regulations here. In D.C., religious leaders were organized to testify at the hearings by Sojourners, Creation Justice Ministries, and Greater Washington Interfaith Power and Light. These hearings are an impressive process. A name is called, each person has 5 minutes as 3 EPA staffers listen intently and take notes. You are timed with a cute little green/yellow/red timer. The hearings last all....day....long. I can't imagine being an EPA staffer and listening all day long. Hopefully they take yoga breaks. When I think about what's going on in Gaza and the Ukraine, this is an incredibly well-organized, non-violent democratic process to garner feedback from the public. I was asked by Joelle Novey of GWIPL to give a testimony. I had the 10:20 slot on July 30th. 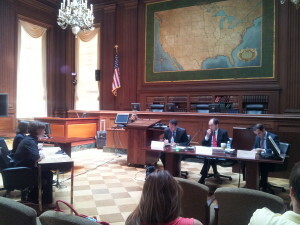 Giving EPA testimony. Picture by Joelle Novey. Here is my testimony, lengthened by 2 minutes from a testimony I gave earlier this year when the EPA was gathering initial feedback prior to the now proposed regulations. 60,000 honeybees call the backyard of Church of the Pilgrims home. Four honeybee hives are part of our urban garden called Sacred Greens. Our honeybees pollinate the vegetables and fruits of our garden, the forest oasis right next to us, Rock Creek Park, and the flowers, fruits and trees of our Dupont neighbors. If you are within 3 miles of Church of the Pilgrims, there is a good chance our honeybees have transformed the flowers of your tomato plants to a tomato fruit. The eggplants, green peppers, basil, beans, butternut squash, and carrots we grow for Sacred Greens, our urban garden, goes to create meals for Open Table, our lunch every Sunday afternoon for 30 or so hungry neighbors. Our newly planted apple and pear trees, and fruit bushes, or permaculture, will soon offer a free healthy snack for anyone walking past our garden. On Sundays our garden is poignantly alive—honeybees buzzing around seeking pollen and nectar and hungry neighbors sharing in casseroles of fresh eggplant, tomato sauce, and basil. In that moment, our backyard is host and home to living beings our society thinks are disposable: honeybees and hungry, homeless folks. Honeybees are the most vulnerable of insects threatened by colony collapse disorder—an ecological crisis created by human agency with pesticides and climate change. Hungry people are the most socially vulnerable of humanity, starving off the lack of access to affordable and healthy food. Since 2006, commercial beekeepers have lost 30% of their hives each year. According to your friends over at the USDA, about one mouthful in three in our diet directly or indirectly benefits from honey bee pollination. According to DC Hunger Solutions, in 2008-2012, 30.5 percent of households with children in the District of Columbia said they were unable to afford enough food. This is the second worst rate in the nation, exceeded only by Mississippi. Climate change suffocates God’s planetary design. We designed our backyard because of our trust in the Holy one and in a Christian Ethic with a moral vision: our garden symbolizes how we are to live as people of God’s Way and shows our intention for living. Psalm 104 states we are to renew the face of the planet. And right now the planet is poor from climate pollution impacting humans and an insect like the honeybee. Oikos is the Greek work for house or household. Oikos is also root for the words ecology and economics. For Christians of the ancient Church, Oikos was not limited to the private home but was referring to the planet itself as the World House, God’s home. Oikos sets Church of the Pilgirms intention in how to be a sacred neighbor; that we are a shared household where all who are born belong and all who live co-habitat; where humans and all of life live into each other’s life and die into each other’s death in a complex pattern of relationships that can nourish, or destroy, creatures like honeybees and vulnerable humans. There is no way around our inter-connnectedness. We are of one household and tethered across inhabited landscapes. It’s the Way of God and Life. Oikos, the household, also assumes limits. The well-being of the planet doesn’t come from a short-term vision of life with a never-ending inhaling of goods, services, and energy. Oikos demands limits on how we as humans live on the planet. Oikos demands a long-term vision that incorporates what we can imagine to be of future generations, particularly the future generations of honeybees and folks who are starving. A long term vision of life calls for us to live as part of the web of life: prophetically reduce carbon production that exacerbates climate disruption that impacts the life of insects, food production, health, and the sheer beauty of nature. The role of the EPA is to regulate the commons. At Church of the Pilgrims, we are doing just that—tending to our eco-location with intentionality to reflect our place in society and God’s home. Church of the Pilgrims charges the EPA to care for the household, the World House, by requiring a 30% reduction in carbon pollution from power plants by 2030.